Originating from a big city, I enjoy biking on a path that has it all; a riverfront car-free park path, a shared path that takes you through industry, as well as a shared bridge path. Portland definitely fills the gamut. My favorite Portland bike path takes you through all of it. After stopping in at Cycle Portland to grab a rental bike, I typically start off in “The Bowl ” at Tom McCall Waterfront Park, a small, intimate amphitheater. It gives me a chance to look over the riverfront and collect my thoughts. Also, it is the central hub for many festivals and concerts. I can also appreciate looking out on the river at the Taiwan-style “Dragonboats ” as they train for their race in early June. Not to mention the baby geese littering the Central Lawn as they chase after their mother! From there I bike along the car-free riverfront path on the West side of the Willamette river. On my way, I’m typically greeted by fellow bikers, runners, and tourists all utilizing and enjoying the little strip along the park. Occasionally, I’ll stop along the way at the Portland Saturday Market at Ankeny Square to see what creativity the vendors are stirring up. I’ll also hang out by the Skidmore Fountain sip some chai from one of dozens of local shops and vendors and watch families play. After riding along the Esplanade I connect with motorists on a shared road named Naito Parkway. It is on this roadway that I ride under the steel lattice work of both the Steel Bridge and the Broadway Bridge, both of which are engineering marvels. From there I hang a left at NW 9th Ave, cross the Amtrak Railway at Union Station and then hang a quick slight right onto NW Overton St. I run this through both the Nob Hill Alphabet District and the Northwest District where I reflect on my days living in a more condensed part of town. After daydreaming a bit, I then continue along NW Overton St. to NW 24th Ave and hang a right. I then run 24th to NW Vaughn St and hang a left. 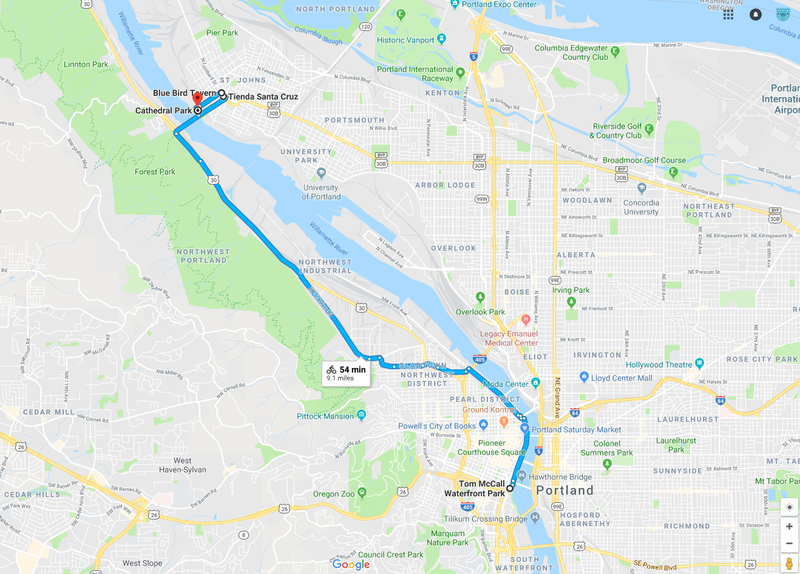 NW Vaughn St. turns into NW Wardway St. I’ll loop around the Adidas Employee Store and hang a left at NW Nicolai St. Nicolai will almost immediately turn into NW St. Helens Road which will take you to Mount St. Helens if you want to get out of town. But we’ll stay on the Portland bike path for now. My ride of choice takes a left from St. Helens Rd onto Bridge Ave where you can merge onto the St. John’s Bridge. Here you can visually capture not only the grandeur of the suspension bridge, but also that of the industries lining the Williamette River. On a good day, you can make out downtown Portland in the distance. I’ve heard you can also capture Mt. Hood but I have yet to experience that. It will be amazing when I do. After traversing the St. John’s Bridge, you will be placed on N. Philadelphia Ave. I take Philadelphia to N Lombard St. and hang a left. I normally go 2 blocks to the Blue Bird Tavern and grab a brew as I reflect on my ride and all that I have encountered. … But it isn’t over yet! After a few (many) brews, I then walk (stumble) 1 block toward N Philadelphia Ave and stop off at the Tienda Santa Cruz and grab a hefty vegetarian burrito. Once settled and sobered, I find my bike parked on Lombard in front of the Blue Bird. I then mount and hang a left on Baltimore, which is the cross street on Lombard around the corner from the Bird going away from N. Philadelphia Ave. From there it is a straight shot to Cathedral Park where you can sit on a park bench and watch the sunset from alongside, or under the St. John’s Bridge. Full and fuzzy, I usually call this the end of the ride. Of course, I still have to get home. But that ride description is for another day! 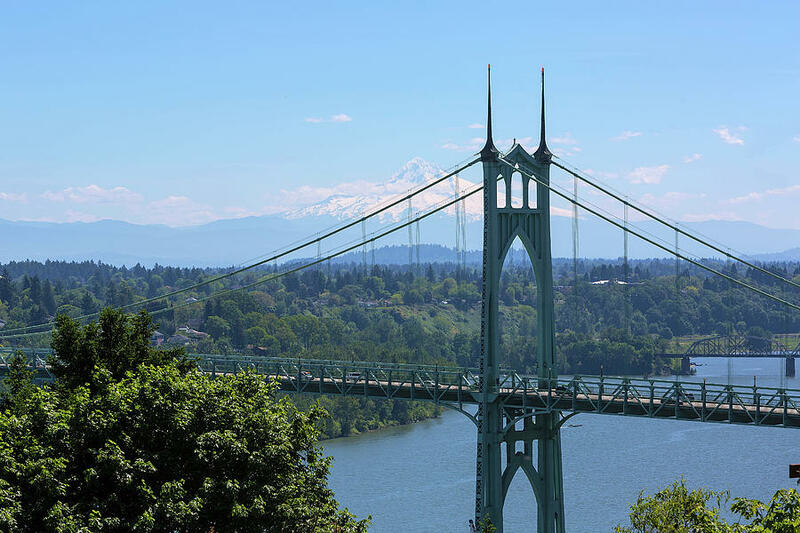 I hope that you enjoyed my favorite Portland bike path! And remember, always wear a helmet! Ride safe!